In this environment, thanks to the daily use of drawing programs in 3D, he discovered his passion for interior design, a profession that in Italy is mostly practiced by architects. Being an architect, though, wasn’t Tommaso’s dream. As a matter of fact, he believes that “architecture itself involves too much bureaucracy and is limited by too many safety laws.” He decided therefore to quit his training in that area to focus on interior design, a field that he strongly associates with the concepts of the art of living and lifestyle. Working with design gives vent to the creativity that Tommaso has shown since he was a child. “When I was only five”, he recalls, “I used to paint my room in different colours and give every object a personal touch”, a clear sign of what he would do as an adult. 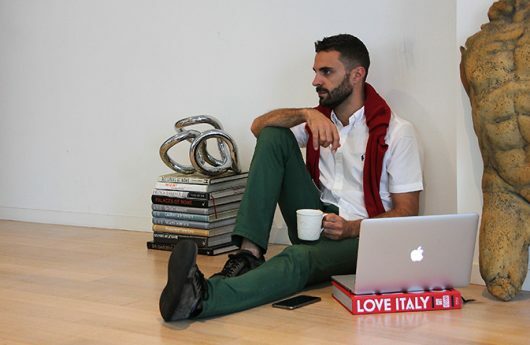 In 2011 Tommaso moved to Melbourne to learn English, a time that he considers a defining moment in his life. While he intended to stay for three months, his curiosity got the better of him and he eventually extended his visit. He travelled around Australia before coming back to Melbourne to study interior design, completing the two-year course in just six months! Just as his visa was about to expire, Tommaso had a clear idea about his future. Instead of returning to cold and snowy Switzerland, in 2014 he finally invested in his expertise by opening a professional studio, Spinzi Design. Apart from creating functional and beautiful interior environments, Tommaso is eager to give each customer the experience of turning ordinary spaces into extraordinary ones, each of them unique and timeless. His consultations are customised and intended to marry individual client’s needs and tastes with his design aims. His work expresses the personality of each individual client and, above all, his/her lifestyle. It follows that the creative process is shared on the spot with his clients, a personal touch that is a vital ingredient of his winning formula. “Our home is the place where we spend most of our time, which is why we must feel comfortable and pleased in it. It’s the mirror of our lifestyle, a way of living that sums up our life’s needs and motivations”, he explains. Working as interior designer requires a large, global knowledge of styles, furniture and the art world with the distinctive mark of the designer’s own flair. Tommaso Spinzi’s design doesn’t disappoint. It is a contemporary cocktail of mixed ingredients: sophistication and surprise created by the combination of old and new elements, attention to detail, cultural heterogeneity, and timelessness. When asked about his plans for the future, Tommaso hints that Australia is just the beginning for Spinzi Designs. His dream is to express his talent all over the world. It seems an extreme ambition but judging from his swift achievements in this country, he may well be able to accomplish it.